Is Your Chatbot Well Versed with Marketing? Marketing with AI Chatbot is the next big thing in digital marketing services where creativity and technology go hand in hand to create responsive advertisements. After the emergence of Snapchat into a full-fledged marketing tool, the next revolutionary thing to happen in business marketing is the blend of Artificial Intelligence and creativity to create a new kind of tool for customer engagement, communication, and marketing strategy. And this has given the rise to chatbot development services. Why choose Chatbot Development Services for Marketing? What Chatbots are, I guess you already know? Still, I would specify that a chatbot is an AI system with which a customer can interact simply by texting. So, you can ask for anything from information to commanding it to perform a function. Want to know the weather outside, or to run a troubleshoot software, AI chatbot can perform it all. Only recently the digital marketing services were completely dominated by social media platforms like Facebook and Snapchat, which made marketing, content creation and propagation a lot easier and speedy, and made borders utterly irrelevant. It was a revolutionary thing in itself. With chatbot app development taking the center stage, it is now seen as a marketing goldmine for all right reasons. Nowhere in the whole chatbots marketing process can you see the involvement of manpower, everything is done with the help of AI consulting. Think of loads of content customers consume, services offered to the customers and transactions securely executed, whenever a customer connects with your company via AI chatbot. Customer engagements have improved extensively because of the magnitude of information and data made available to customers which they can now access on their own with the help of bot development services. It was not always the case before the advent of Bots. To give responses to customer queries, to offer them the information they are looking for, businesses took a lot of time and manpower to get in touch to respond, but, by then, the customer is already gone. But chatbot development services has made it a matter of seconds and clicks. 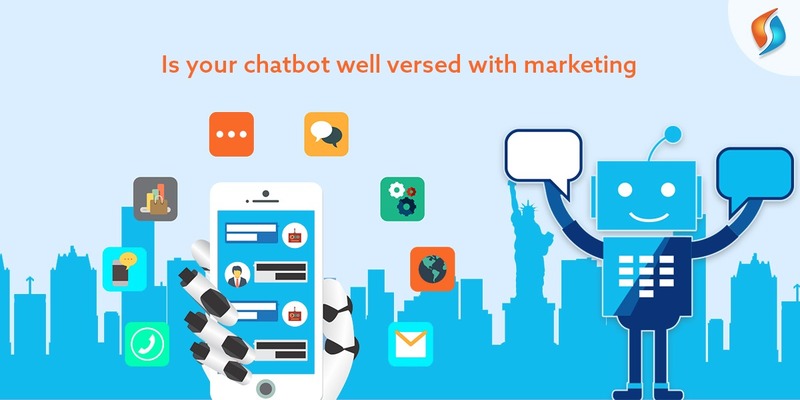 Now using the chatbot development platforms you can market your product while producing information and transform your customers into potential buyers. The best part is they buy through the AI Chatbot. As a business owner, you just cannot kind of ignore the marketing potential Chatbots have. A report published in Forbes has revealed that as many as 1.4 billion people worldwide interacted via Chatbots in the year 2015 alone. It is only obvious to believe that number must have skyrocketed by now. Whenever customers interact through AI chatbots, they store the data from previous conversations and the next time the same customer turns up, they respond more effectively and in a detailed and personalized manner. It often gets hard for small businesses to manage time for various tasks. That directly impacts your customer relationships because of the dearth of time and manpower to attend to them. The result is customers fly away. But you can retain with the help of chatbot development services. When a customer interacts through Bot, it asks customers preferences, styles and tailors the information accordingly and gives recommendations completely matching what customers want. So AI chatbot sells products and services on your behalf, efficiently and quickly. Chatbot development platforms are so advanced these days that these bots can process payments completely on their own. If you`re lacking the conviction to create your own chatbot, you certainly as the business owner are missing plenty of marketing benefits to reap with AI chatbot. It saves you counter space where customers form long queues to pay bills, saves you manpower behind the counter and time as well. Now with the help of chatbot development services you can store data to get actual business insights that can boost sales, productivity and company profits. It follows customer habits closely and also monitors their buying preferences. Using this data, you can offer every customer a personalized service based on their tastes and preferences, which is crucial to do for any marketing strategy. Similarly, you can also figure out a pattern out of queries customers make through bots, it can help to offer them relevant information. The time today definitely belongs to business automation. From the customer experience stored by AI chatbot as data, you can run a personalized marketing strategy. It does it through interaction, which is close to how a human would sell a product. Also, you can introduce your other products to your customers. Maybe that can grab their attention and another day they consume those products, too. It cannot happen anywhere else, but alone through an AI Chatbot. AI chatbot engages your customers. It strikes a relationship with customers by making them ask more and more about your brand in an engaging way. The more it introduces these things, the more likely they are going to buy your product. Moreover, it does not let user engagement fade away. These are only a few marketing tasks AI chatbot are capable of doing, but they are enough to give you an idea on how Chatbot app development will be beneficial in your marketing process. Chatbot app development for internal operations can improve your employee satisfaction index as well. Chatbots save you time, money and manpower by interacting with your customers, seizing a deal and offering customer services. It does everything with specific goals and targets already programmed in it. This makes it more efficient than a human doing the same thing. Hiring the best Chatbot Development Company! Now, you may be looking for machine learning companies to reap the benefits that come with chatbot app development. If that is the case, are you searching for the best chatbot developers? Let me assure you, you have nowhere else to go. Join hands with Signity Solutions to create your own chatbot for your company. We understand the needs of every company, big or small, and offer the best chatbot development services.